The April 2018 edition of The Guitar Magazine is out now featuring a FREE digital guitar DIY handbook containing 132 pages of essential tone tops, mods and upgrades that’ll make your guitar sound and play better today. 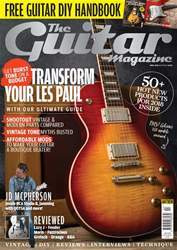 Inside the main mag we go in-depth with Les Pauls and unlock the secrets of authentic 1950s tone. Spoiler alert: it’s not all about ‘old wood’ – we explain how your guitar can go toe-to-toe with a Burst or Goldtop without selling your house to fund a vintage purchase. We also put a pair of Gibson’s new 2018 Les Pauls to the test but if Lesters ain’t your thang, fear not – in addition we check out gorgeous new gear from Fender, Gretsch, B&G and more, including a brand new Lazy J that might just be Jesse Hoff’s finest amplifier to date. Elsewhere in this month’s mag we catch up with JD McPherson, who tells all about recording at RCA Studio B and jamming with Queens Of The Stone Age, pay tribute to legendary innovator Ray Butts and give you the chance to win an awesome Chase Bliss Audio Tonal Recall delay pedal worth £399. Pick up your copy of the feature-packed April 2018 issue of The Guitar Magazine now from WH Smith, Asda, Tesco, Morrisons, Waitrose, Easons and all good newsagents.